A SENSE of place is an ineffable thing, a compass whose needle pulls you in different directions. Whenever I return to my hometown, what I see is a matter of perspective. From afar, Inverclyde’s panorama makes for an enchanting composition as the rolling hills of Argyll cusp the Clyde estuary. At this time of year, when winter sifts her icing sugar over the summits of Tom na h-Airidh and Ben Bowie, you could wish to be nowhere else. As the rural collides with the urban, the foreground gives up its scarred beauty grudgingly. The domed towers and Doric porticos of grand Neoclassical architecture stand sentinel over a waterfront pocked with office space and broad smears of brownfield. The water is where everything flows. Its quays and harboursides once bustled with shipments of lace, tobacco, rum and raw cane sugar. Come the age of industry, they rang to the din of shipyards where men forged ironclad colossuses and something else; something intangible. Nowadays, there is a steady tide of freight and ocean liners, but the riverbanks thrum to a perfunctory rhythm, synchronised by call centres, budget hotels, mail-order warehouses and drive-thru fast food chains. Such occupants bring much-needed employment, but they feel transient, interlopers in a world of workmanship. In years to come, no man will sing their elegies. G-R-E-E-N-O-C-K for all to see on dun-coloured moorland. Until now, the only vague commonality between the two places has been Deborah Kerr, that graceful daughter of Helensburgh who was a stalwart of cinema’s golden age. 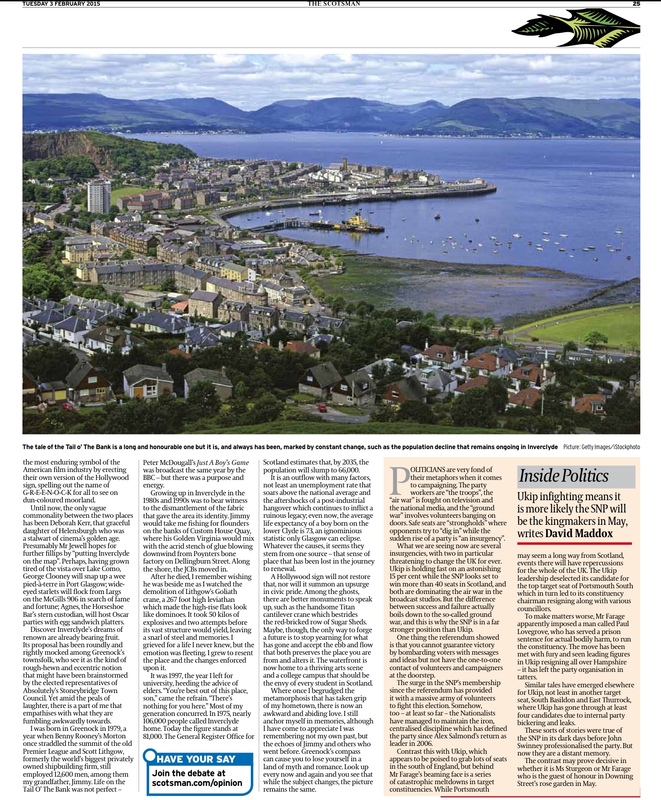 Presumably Mr Jewell hopes for further fillips by “putting Inverclyde on the map”. Perhaps, having grown tired of the vista over Lake Como, George Clooney will snap up a wee pied-à-terre in Port Glasgow; wide-eyed starlets will flock from Largs on the McGills 906 in search of fame and fortune; Agnes, the Horseshoe Bar’s stern custodian, will host Oscar parties with egg sandwich platters. Discover Inverclyde’s dreams of renown are already bearing fruit. 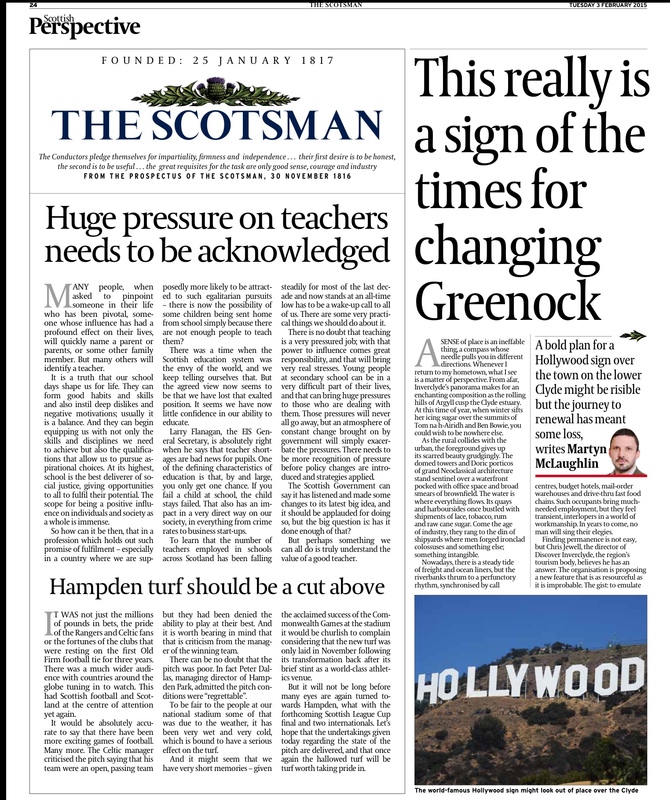 Its proposal has been roundly and rightly mocked among Greenock’s townsfolk, who see it as the kind of rough-hewn and eccentric notion that might have been brainstormed by the elected representatives of Absolutely’s Stoneybridge Town Council. Yet amid the peals of laughter, there is a part of me that empathises with what they are fumbling awkwardly towards. I was born in Greenock in 1979, a year when Benny Rooney’s Morton once straddled the summit of the old Premier League and Scott Lithgow, formerly the world’s biggest privately owned shipbuilding firm, still employed 12,600 men, among them my grandfather, Jimmy. Life on the Tail O’ The Bank was not perfect – Peter McDougall’s Just A Boy’s Game was broadcast the same year by the BBC – but there was a purpose and energy. Growing up in Inverclyde in the 1980s and 1990s was to bear witness to the dismantlement of the fabric that gave the area its identity. Jimmy would take me fishing for flounders on the banks of Custom House Quay, where his Golden Virginia would mix with the acrid stench of glue blowing downwind from Poynters bone factory on Dellingburn Street. Along the shore, the JCBs moved in. After he died, I remember wishing he was beside me as I watched the demolition of Lithgow’s Goliath crane, a 267 foot high leviathan which made the high-rise flats look like dominoes. It took 50 kilos of explosives and two attempts before its vast structure would yield, leaving a snarl of steel and memories. I grieved for a life I never knew, but the emotion was fleeting. I grew to resent the place and the changes enforced upon it. It was 1997, the year I left for university, heeding the advice of elders. “You’re best out of this place, son,” came the refrain. “There’s nothing for you here.” Most of my generation concurred. In 1975, nearly 106,000 people called Inverclyde home. Today the figure stands at 81,000. The General Register Office for Scotland estimates that, by 2035, the population will slump to 66,000. It is an outflow with many factors, not least an unemployment rate that soars above the national average and the aftershocks of a post-industrial hangover which continues to inflict a ruinous legacy; even now, the average life expectancy of a boy born on the lower Clyde is 73, an ignominious statistic only Glasgow can eclipse. Whatever the causes, it seems they stem from one source – that sense of place that has been lost in the journey to renewal. A Hollywood sign will not restore that, nor will it summon an upsurge in civic pride. Among the ghosts, there are better monuments to speak up, such as the handsome Titan cantilever crane which bestrides the red-bricked row of Sugar Sheds. Maybe, though, the only way to forge a future is to stop yearning for what has gone and accept the ebb and flow that both preserves the place you are from and alters it. The waterfront is now home to a thriving arts scene and a college campus that should be the envy of every student in Scotland. Where once I begrudged the metamorphosis that has taken grip of my hometown, there is now an awkward and abiding love. I still anchor myself in memories, although I have come to appreciate I was remembering not my own past, but the echoes of Jimmy and others who went before. Greenock’s compass can cause you to lose yourself in a land of myth and romance. Look up every now and again and you see that while the subject changes, the picture remains the same.